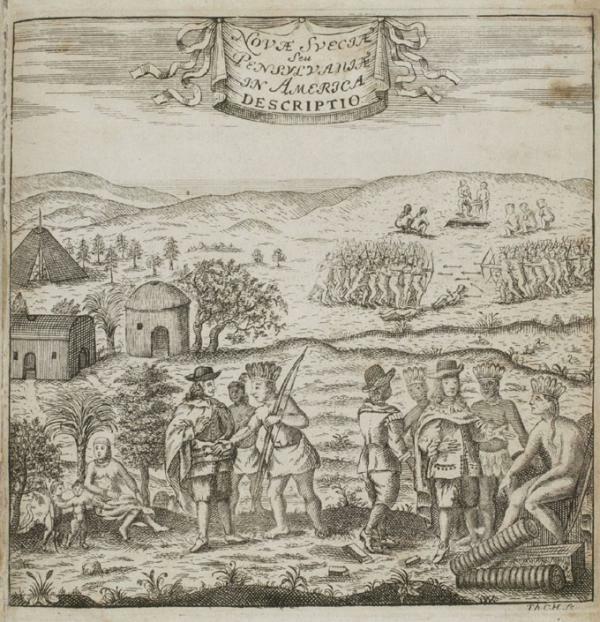 Frontpiece to Kort abeskrifning om beskrifning om provincien Nya Swerige uit America...[ A short description of the province of New Sweden], by Thomas Campanius Holm, 1702. Flip to Gloria Dei (Old Swedes') Church, Philadelphia, PA, 1828. In this 1702 engraving, Swedish artist Thomas Campanius Holm depicted a friendly exchange between local Indians and traders in New Sweden, on the Delaware River. Tomas, who never visited North America, based his fanciful image – including palm trees– upon descriptions written by his grandfather who had lived in New Sweden in the 1640s.